"A heavy-handed sticks and carrots policy may work with donkeys but not with serious countries. The United States would have a better chance of success if the White House abandoned its threats of military action and its calls for regime change". In the below article published in the Washington Post on the 27th of May 2008, Zbigniew Brzezinski (a National Security Adviser in the Carter Administration) and William Odom (a retired Army lieutenant general, and a former director of the National Security Agency), criticize the US policy towards the Islamic Republic and examine other constructive options. Both are affiliated with the Center for Strategic and International Studies. Current U.S. policy toward the regime in Tehran will almost certainly result in an Iran with nuclear weapons. The seemingly clever combination of the use of "sticks" and "carrots," including the frequent official hints of an American military option "remaining on the table," simply intensifies Iran's desire to have its own nuclear arsenal. Alas, such a heavy-handed "sticks" and "carrots" policy may work with donkeys but not with serious countries. The United States would have a better chance of success if the White House abandoned its threats of military action and its calls for regime change. Consider countries that could have quickly become nuclear weapon states had they been treated similarly. Brazil, Argentina and South Africa had nuclear weapons programs but gave them up, each for different reasons. Had the United States threatened to change their regimes if they would not, probably none would have complied. But when "sticks" and "carrots" failed to prevent India and Pakistan from acquiring nuclear weapons, the United States rapidly accommodated both, preferring good relations with them to hostile ones. What does this suggest to leaders in Iran? To look at the issue another way, imagine if China, a signatory to the nuclear Non-Proliferation Treaty and a country that has deliberately not engaged in a nuclear arms race with Russia or the United States, threatened to change the American regime if it did not begin a steady destruction of its nuclear arsenal. The threat would have an arguable legal basis, because all treaty signatories promised long ago to reduce their arsenals, eventually to zero. The American reaction, of course, would be explosive public opposition to such a demand. U.S. leaders might even mimic the fantasy rhetoric of Iranian President Mahmoud Ahmadinejad regarding the use of nuclear weapons. A successful approach to Iran has to accommodate its security interests and ours. Neither a U.S. air attack on Iranian nuclear facilities nor a less effective Israeli one could do more than merely set back Iran's nuclear program. In either case, the United States would be held accountable and would have to pay the price resulting from likely Iranian reactions. These would almost certainly involve destabilizing the Middle East, as well as Afghanistan, and serious efforts to disrupt the flow of oil, at the very least generating a massive increase in its already high cost. The turmoil in the Middle East resulting from a preemptive attack on Iran would hurt America and eventually Israel, too. Given Iran's stated goals -- a nuclear power capability but not nuclear weapons, as well as an alleged desire to discuss broader U.S.-Iranian security issues -- a realistic policy would exploit this opening to see what it might yield. 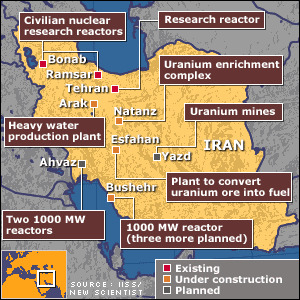 The United States could indicate that it is prepared to negotiate, either on the basis of no preconditions by either side (though retaining the right to terminate the negotiations if Iran remains unyielding but begins to enrich its uranium beyond levels allowed by the Non-Proliferation Treaty); or to negotiate on the basis of an Iranian willingness to suspend enrichment in return for simultaneous U.S. suspension of major economic and financial sanctions. Such a broader and more flexible approach would increase the prospects of an international arrangement being devised to accommodate Iran's desire for an autonomous nuclear energy program while minimizing the possibility that it could be rapidly transformed into a nuclear weapons program. Moreover, there is no credible reason to assume that the traditional policy of strategic deterrence, which worked so well in U.S. relations with the Soviet Union and with China and which has helped to stabilize India-Pakistan hostility, would not work in the case of Iran. The widely propagated notion of a suicidal Iran detonating its very first nuclear weapon against Israel is more the product of paranoia or demagogy than of serious strategic calculus. It cannot be the basis for U.S. policy, and it should not be for Israel's, either. An additional longer-range benefit of such a dramatically different diplomatic approach is that it could help bring Iran back into its traditional role of strategic cooperation with the United States in stabilizing the Gulf region. Eventually, Iran could even return to its long-standing and geopolitically natural pre-1979 policy of cooperative relations with Israel. One should note also in this connection Iranian hostility toward al-Qaeda, lately intensified by al-Qaeda's Web-based campaign urging a U.S.-Iranian war, which could both weaken what al-Qaeda views as Iran's apostate Shiite regime and bog America down in a prolonged regional conflict. Last but not least, consider that American sanctions have been deliberately obstructing Iran's efforts to increase its oil and natural gas outputs. That has contributed to the rising cost of energy. An eventual American-Iranian accommodation would significantly increase the flow of Iranian energy to the world market. Americans doubtless would prefer to pay less for filling their gas tanks than having to pay much more to finance a wider conflict in the Persian Gulf.